Школа игры на фортепиано. Практическое пособие для домашних занятий. + DVD. Учебное пособие. 3-е изд., стер. This manual consists of textbook and DVD. The main guestion is how to play the piano, how to solve problems concerned with a work with musical composition. The textbook tells about discussion and learning of a musical work with the examples from repertoir of music schools. It tells ahout melody, arrangement, polyphony, pedaling. This textbook is based on the pedagogical principles of an outstanding musician professor V. V. Nilsen. 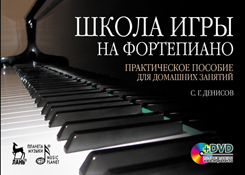 The author of this book is an experienced instructor, a docent in the department of concertmaster and music education at the Vaganova Ballet Academy, an instructor in the department of special piano at the Rimsky-Korsakov St. Petersburg State Conservatory. The textbook is intended for music school's students, their parents, teachers and everyone interested in music.